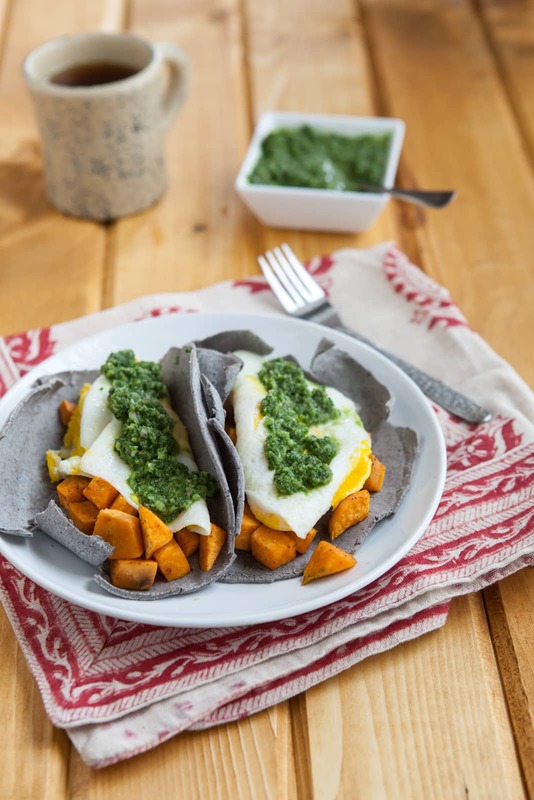 Breakfast Tacos with Kale-Cilantro Chimichurri Sauce | Naturally. Nothing really feels right to write today. I’m still digesting the weekend. I love spending time with people who understand why I care about the food the way I do. I want to share some of those thoughts with you but today is not the day. Too much fogginess. For now, you can pop over and look at the photos from the first day of the trip. So instead I leave you with delicious breakfast tacos. I’ve been craving breakfast tacos ever since Kimberly posted her tacos with a radish salsa. 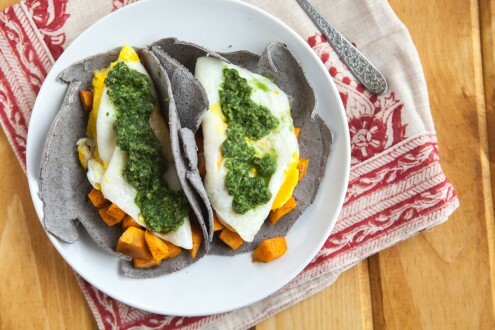 I love veggie tacos (especially these sweet potato ones.) I had an abundance of Kale and cilantro from the CSA and I’ve been learning more about different types of garnishes. If you love cilantro, try this chimichurri. Chimichurri is originally from Argentina and reminds me of a parsley pesto. So instead, I used what I had (and it turned out delicious.) I saved the extra sauce and topped eggs the next morning but I have to think it would be delicious on so many other things! Ps- I’m afraid with all the traversing of the country side, I didn’t fit in this week’s The Food Matter’s project. I promise I’ll be back next week! For now, check out everyone’s take on this week’s recipe. Preheat oven to 400˚. Peel and cut sweet potatoes into 1/2″ cubes. Toss with olive oil and chipotle powder. Roast until tender and just turning brown, 15-20 minutes. While sweet potatoes bake, combine ingredients for sauce in either a blender or food processor. Pulse until well combined. Once potatoes are done, lightly heat up the tortillas and layer the sweet potatoes, egg, and chimichurri sauce. Chimichurri sauce keeps well for a couple days following and works great on eggs, salads, rice bowls, etc. What kind of tortillas are shown in the photos? Blue Corn Tortillas. I’m in the process of figuring out how to make my own so for now I use these ones I buy at Whole Foods. I love everything about this! Looks amazing! MY kind of breakfast… hands down. Totally making this… tonight! I will have to skip the tortillas, but everything else will work! I’ve been putting kale into everything lately, but I haven’t thought of putting it into a chimichurri. Great healthy idea! That Kale-Cilantro sauce sounds awesome! Breakfast tacos with fish? What a fantastic idea! I’ve only had them with eggs before. Breakfast tacos sound good to me no matter the time of day, especially when they’re stuffed with sweet potatoes AND kale! So glad to hear you’ve had such a lovely weekend! These look fantastic. Oh, by the way, I think you should change your blog name to The Sweet Potato Queen! You rock a sweet potato like no one else, girl. Tacos for breakfast. That is living. These sound like such a great idea. I love the combination of sweet potatoes with spicy kale! 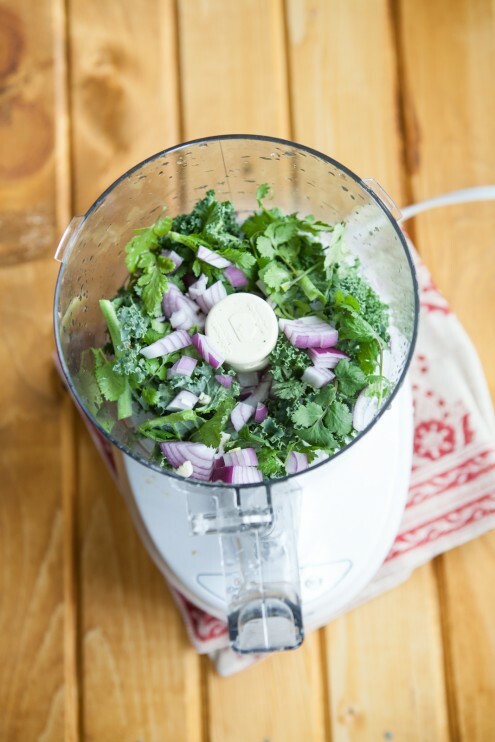 Love the sound of the kale-cilantro chimichurri. Yum!!!!! How did I neglect to comment on this? I love chimichurri and am so inspired by your clever addition of kale. Next time I make it, I am totally putting kale in. YUM! Thank you Kimberley! I’m slightly addicted to it now and am putting this sauce on everything! 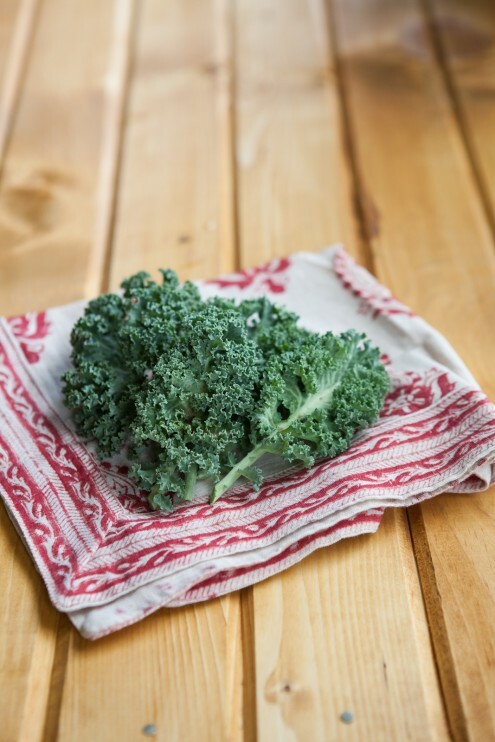 We just had toasted english muffins with cheese, eggs, and this kale sauce for a throw together brunch. Super yum. My 5 and 9 year old didn’t make a peep about the sneaky kale sauce. The green was fine by them as long as it’s not in the shape of a large leafy green.